One of the biggest fashion trends for 2018 is dressed-up track pants. I’m pretty excited about this trend because I rocked track pants nonstop back in college. The main difference is that I wore them like pjs, with baggy college sweatshirts and sneakers. 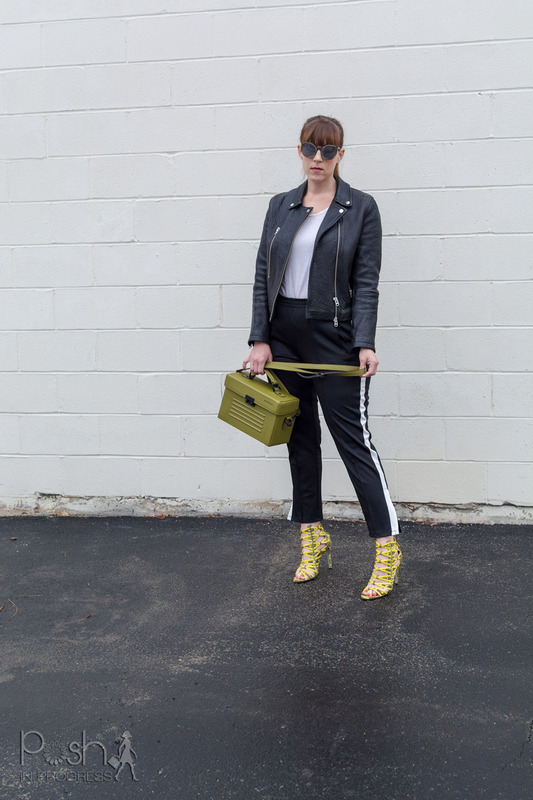 The track pants look for 2018 is a lot more elevated an chic. Probably the best way to instantly dress up track pants is to wear them with heels. I’ve seen them paired with block heel sandals, suede pumps, strappy sandals, or mule heels. Basically, any dressier shoe with a heel looks pretty hot. I love the look of track pants with statement accessories. It’s great if you can choose one accessory as a focal point, like my new favorite bag from Bagology London Studio. Isn’t it just so cool and edgy? I’m totally obsessed with the army green color. I think it works so well against my black track pants. Plus, it has an urban feel that also works so well with the pants, while juxtaposing the ultra high heels. If you’re more into jewelry than bags, I also love the idea of adding tons of gold jewelry. In my opinion, you can’t get enough. Layer on chunky gold necklaces, add lots of gold bangles, and don’t be shy with big earrings. The more, the better, since the track pants are so casual. Another way to really elevate track pants is to throw on a button blazer or wear them with a fitted jacket. I’ve seen them paired with a moto jacket, which looks super cute. I’ve also seen them with a classic single button blazer and heels, which takes a work-wear spin. A totally unexpected way to wear track pants is to wear a button down top. Most of the girls I’ve seen rocking this look keep the shirt untucked, maybe only buttoned in the middle, leaving a few of the top and bottom buttons undone. I’ve also seen some girls tie them into knots so they show the waist band of the track pants. Most of the button downs are oversized with prints, either stripes or plaids. Definitely, this is a fun way to play with shape and juxtaposing dressy with casual. A good way to really change up the vibe is to pair them with a ruffled blouse, off the shoulder top, or cropped angora sweater. 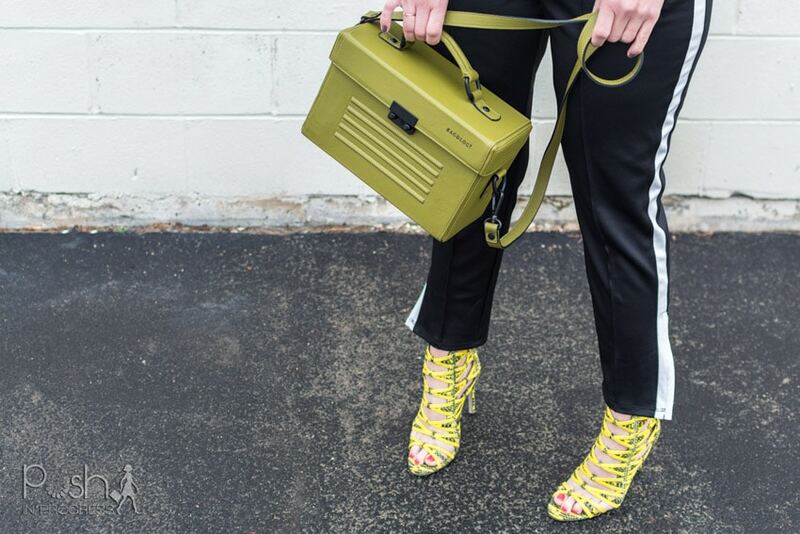 The best part about the track pants trend is that nearly anything goes. These are just five tips for styling track pants. If you want more inspiration on how to wear track pants, check out this story and this story.